Hammerheads are the Tau Empire's standard battle tank. It is a hardy vehicle that can has changed roles as time has gone on. Once the premier anti-tank vehicle in the game, now the bane of infantry everywhere. The Hammerhead is a skimmer tank with average armour of AV13/12/10. Like most Tau vehicles, it carries a pair of drones that can be swapped out for a Twin-Linked Smart Missile System. It has access to all the regular equipment upgrades, carries one of two awesome primary weapons, and even has the option for the Hammerhead Ace: Longstrike. The main weapon is either the signature Railgun or the new and improved Ion Cannon. Previously, the Ion Cannon was less attractive next to the Railgun but it has been remade in the 6th edition codex (and the 7th edition changes to vehicles). The price tag is modest and it is a vital component in fully mechanized Tau lists, but is often passed over for Broadsides in hybrid or gunline armies. When it was first released, the Railgun's range and stats were unheard of (8'x4' boards were more common back then too). The Hammerhead was an instant favorite as a tank hunter. It was tough, very mobile, and lethal. Infantry was a secondary target, fired at by the secondary system, thanks to the vehicle Target Lock. This changed when 6th edition codex hit. Under the current edition the Hammerhead has moved away from Tank Hunting and has chosen to excel at clearing infantry. Thanks to the large blasts from either of its main weapons, it is the Tau's primary pie-plate launcher (except maybe the Riptide's overcharged Ion weapon) so it targets large groups of infantry. To a degree, the Riptide can imitate the Hammerhead's weaponry, on a more mobile Monstrous Creature, firing platform. Normally, this would replace the Hammerhead, but Riptides are Elites, so you can have both! It is also a tough nut to crack. AV13 or AV12 can be hard to kill even when the tank doesn't Jink or jump around cover. Therefore, it also serves as a bullet magnet for your lighter Devilfishes, taking the heat so they can steal objectives. Like the Riptide, it is a high profile target that has to be used as bait, luring your opponent into bad positions or bad decisions. It can also be used in an Anti-Tank capacity, but will often require the Longstrike upgrade to reach acceptable efficiency. A Hammerhead works well without upgrades, however it will almost always be fitted with a Blacksun Filter. Sensor Spines are pure gold, so they are a favourite choice as well. Smart Missile Systems can replace the Drones, but it is entirely player preference. Disruption Pods are popular, but I find them to be less useful in 7th edition. Hammerheads cannot Jink if they want to continue firing their large blasts, so they will rely on terrain for cover saves. Even so, +1 to a cover save is never a waste, even if your Hammerhead spends the whole game in the open. If the Railgun is equipped, you'll need Submunitions if you want that large S6 AP4 blast for clearing infantry. However, Ion Cannons are the more popular choice of primary gun. The large S8 AP3 blast is too good to pass up, even if it does have a 1 in 6 chance of failing altogether. Personally, I am a fan of the Railgun with Submunitions. It is consistent (does not Get Hot) and the Riptide has a harder time duplicating the effect. True, the riptide burst cannon has the same Strength and AP, but Riptides are inaccurate and have a hard time landing as many hits as a Hammerhead. As an Ion platform, the Hammerhead is overshadowed by the Riptide and its Ion Accelerator. The Hammerhead Ace: Longstrike changes your target priorities. To get the most out of his BS5 Tank Hunter abilities, he should be killing vehicles. If he has a Railgun, then he has a 15% chance of killing a Land Raider in a single shot (which is actually pretty good in 7th edition). Giving him an Ion Cannon yields great results when he is targeting lighter armour too. All around he is good, but the cost drives the total price of the Hammerhead a bit high for most players to be comfortable fielding him. However, against Astra Militarum, Longstrike is almost an auto-include as he basically re-rolls all of his to-hit, to-wound, and to-penetrate rolls. I wont talk much on the Forgeworld turret variants. Mostly because I feel that none of them are really awesome under the 7th edition rules. So here is a quick rundown on each. I have playtested the burst cannons, but I have yet to try the others. Two Long Barrelled Burst Cannons: Not bad, but in the end it is just more S5 AP5 shots. If that is what you want then this is actually not a bad way to go. I used it with my Farsight Enclaves (not much S5 AP5 there) and it did ok.
Two Twin-Linked Missile Pods plus Velocity Tracker: Interesting. Seems like a solid anti-air option, especially since Skyrays got nerfed so hard. Lonstrike could make for an interesting combo here, even if it does end up pretty expensive. I'm working on a conversion using some High Yield Missile Pods. Two Plasma Cannons: good for MC hunting, which might actually be worth it with all the Riptides, Wraithknights, Daemons, and other MC's running around. But it has to remain stationary to be fully effective. Running solo, it may not cut it, but two of these could ruin a Wraithknight or Riptide's day in a hurry. Two Fusion Cannons: At 12" it could crack Land Raiders, but if a Land Raider is 12" away, it is too late already. Of all the variants, this one impresses me the least. The fact that the weapons are Blast means the Hammerhead absolutely cannot move if it wants to fire at full effect. However, with a 24" range it will need to move if it wants targets. Still, I'm sure it can be effective in the right circumstances. Deep Striking TEQ or any Deep Striking non-flying vehicles would be the targets of the choice. It could be useful at taking out Rhinos and the like as well. The Hammerhead fits in well with other Tau vehicles and with battlesuits. 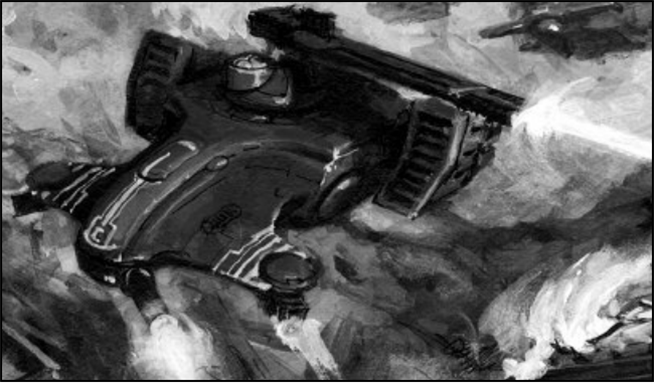 The anti-infantry firepower the Hammerhead brings, can replace (to a degree) the need for Tau infantry. Battlesuits often have specific roles, and anti-infantry is seldom one of them, so the Hammerhead picks up the slack. In addition, the Hammerhead can keep pace with Crisis Suits, and soaks up the S8+ firepower that would normally be insta-killing your XV8's. Riptides carry similar firepower, and the Hammerhead provides redundancy without spamming Riptides and without attracting too much attention. When used alongside vehicles, it saturates the field with armour, forcing your opponent to make harder decisions. There is only so much anti-tank to go around, and in most games your opponent will have to choose between the super-scoring Devilfish and the big-gun-toting Hammerhead. Sit in or behind cover, then shoot the preferred target until the enemy kills it. It will act as a base for your army to move around, and will also serve as bait for your Kayoun tactics. The Hammerhead can put a pie plate just about anywhere on the board. The Submunitions tear through anything but power armour equivalents. The overcharged Ion Cannon wipes away 3+ armour with ease. Just point it at the preferred infantry target and shoot. Your opponent will need to address it, and it is basically bait anyways. Broadsides can emulate the firepower with their High Yield Missile Pods, but they are less mobile and are not as tough. The Riptide is one of the only other units capable of delivering a pie plate like the Ion Cannon, but is a bit more expensive and is a different beast altogether. The Riptide works like bait too, but more as an "in your face" type of bait. A drawback when playing this way, is that it cannot snap-shoot the pie plate. If it is forced to Jink, it is effectively useless for a turn. When forced to jink, use the next turn to move Flat Out and reposition. When combined with Longstrike, a Hammerhead becomes a fairly potent anti-tank platform. Either a Railgun or an Ion Cannon will work, as its targets should usually be light-to-medium armour. Broadsides will often do this better, for cheaper, but some people really want to kill enemy vehicles with one shot, and Longstrike in a Railhead is one of the best units in the game for doing exactly that. Even so, for him to be worth it, you'll need to kill a couple vehicles, and you'll need at least 3-4 turns to make that happen. When playing this way, the Hammerhead needs to stay alive longer, so it may need to move about the board and keep out of reach. It still can't Jink, but it can at least buy itself another turn or two of shooting. In order to keep it shooting at full capacity, you'll need defensive upgrades, marker light support, and a Riptide or something similar for attracting attention away from your Hammerhead. You may find yourself frustrated (I swear my Longstrike has missed more shots than he has hit) but all that anger melts away when he finally nukes that Land Raider on turn 1. I wouldn't recommend the anti-tank role in a tournament setting (too much variance in performance) but I would recommend that everyone try him in at least a couple games. Hammerheads are an oldy but a goody. The 6th edition Tau Codex and the 7th edition of 40k were not kind to this vehicle, but it is still worth putting on the table. Its powerful weapons are often overlooked for the newfangled Riptide's and it is hard to compete with Broadsides for a heavy support slot, but it manages. In a full Mechanized list, Hammerheads are necessary for supporting your battlesuits and Devilfishes. In a static Gunline, it still pumps out nice large blasts. It isn't an OP unit but it isn't one of the "losers" of the codex either (Vespid). It is iconic and I think it has a place in just about every Tau army, even tournament ones. It may not be the crazy good tank that it was before, but it is still pretty darn. Let us know what you think. Did we miss something? Do you use your Hammerheads for other purposes? Do you use them at all now that the Riptide is top dog? My primary opponent is IG, and even with longstike I often find them disappointing. He mainly runs tank heavy lists. So I have hung up my hammerhead lately. But I can totally see it as a good infantry killer. I ran the ion cannon variant in a game against a nurgle space marines army, and while i lost, i found the riptide and hammerhead did their fare share in the battle. Nice write up. Hammerheads are the model that got me into tau to start. Though I would mention that the Fusion cannon has a total range of 24" so it's only melta at 12". You won't be stopping any land raiders until it too late! Whoops! Very correct. I've edited the post. I knew that range was too good to be true! 3 rolls, plus an enemy cover/invul save if he has one, is just too many rolls for something to go wrong. Question regarding Sensor Spines; I don't quite follow why you need Moves Through Cover on a Skimmer. Doesn't that mean that difficult/dangerous terrain is ignored anyway?